Passengers are welcome to board our ship at 6:00 p.m. After comfortably settling into your cabins, we'll introduce our crew at a welcome cocktail before dinner. Join us on an excursion for both packages: Tour of Amsterdam by night on board a river boat. This morning, join us on an excursion for both packages: Guided tour of Giethoorn, a charming lakeside town, followed by a boat ride on the canals. DISCOVERY: Bike tour on the polders and guided visit of an old windmill from the 17th century which is still in operation. This morning, join us on an excursion for both packages: Stroll through the Keukenhof Gardens. 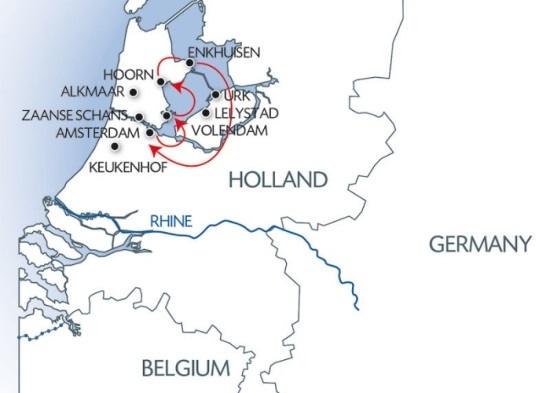 Outside the opening dates of the park, this visit will be replaced by an optional guided tour of Volendam, a port specialized in eel-fishing, and Zaanse Schans. Enjoy some free time this afternoon to discover Amsterdam at your own pace.